The other weekend, we drove down to Atlanta, GA, to see my niece get baptized. On the drive down we saw a few places that you could get fresh peaches, and thought about stopping and getting some on the drive back. We ended up not stopping because when you are drive 9+ hours with a 2 year old and a 3 month old (at the time) and everyone is asleep, the last thing you want to do is stop. So my in-laws actually ended up bringing us some peaches back when they came home the next weekend. We ended up with a full peck of very juicy and sweet freestone peaches. 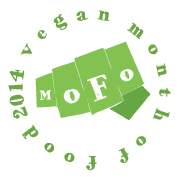 We were mostly just eating them and I used a few for smoothies. Emma really LOVED the peaches she would ask for one and the eat it like an apple. You couldn’t slice it up for her or she would get upset, and if you didn’t watch her she would keep grabbing peaches and take a bite out of each one. 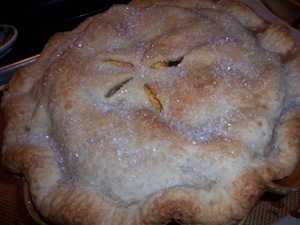 I decided with the last few peaches I would make a pie. I used the recipe in Vegan Pie In The Sky. I ended up having WAY more than the 6 cups the recipe called for. I did use my deep dish pie pan, however, I didn’t increase the amount of flour or sugar in the filling. The pie was sweet enough, but it was a bit on the watery side so it needed the extra flour. Especially with how juicy the peaches were. I forgot that using flour makes the filling cloudy and I thought about using tapioca but figured I would just follow the recipe. Also, I am one of those people that likes cinnamon in my peach pie, but I didn’t know how cinnamon and basil would be together. Funny thing is the filling was so simple that it actually reminded me of the flavor of canned peaches. The pie crust had me wary because it consisted of 8 tablespoons of Earth Balance Buttery Sticks and 8 tablespoons of non-hydrogenated shortening. It was mainly the Buttery Sticks because sometimes I really can taste the soy in the baked goods that I make with them. The crust actually turned out great and I actually didn’t notice the flavor of soy in the pie crust that much. This weeks Tuesdays With Dorie is being hosted by Marlise of The Double Trouble Kitchen and Susan of The Little French Bakery. 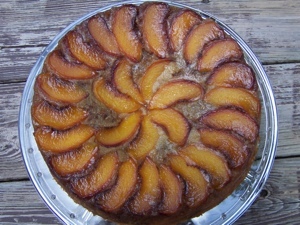 The recipe for this week is Nectarine Upside-Down Chiffon Cake, which is located on pages 241-243 in Baking With Julia. I actually had peaches on hand,so I decided to go with peaches instead of nectarines. The are actually a few steps to this recipe: melting butter in a pan/adding brown sugar/placing the fruit, making/baking the crumb filling, and then making the cake batter and layering it with the crumb filling, and finally baking. I was actually really glad that I read the recipe through before tackling it because I would have completely messed up the recipe. I didn’t have any almonds on hand so I decided to use hazelnuts instead, which turned out great. The cake baked up nicely except the center of the cake did this weird sinking thing, but it wasn’t too noticable when it was turned out of the pan. The cake turned out great. I loved the flavor, but the use of the peaches might have been a bad idea. Flavorwise it was perfect, but the peaches gave off A LOT of juice. It was almost like the cake had its own peach sauce poured over the top, so the top/bottom was very moist. I would definately make this recipe again, but I would use the correct ingredients and see of that correctedany of the sinking/moist problems that I had. This weeks Tuesdays With Dorie is being hosted by Lisa of Tomato Thymes in the Kitchen and Andrea of The Kitchen Lioness. The recipe they are investigating is the Berry Galette, which is located on page 377 of Baking With Julia. I decided to mix it up this week and most stick with just berries. The peaches at the market have been simple perfect lately, and that has to be one of my many favorite things. I am hoping that Mike will plant some freestone peach trees in the next year. We just planted some apple trees, which will take about 4 years to start producing. Which will be just in time for Emma to be old enough to start helping in the kitchen. Back to the peach situation. To keep with the berry theme, I decided to add a few raspberries. Who doesn’t love the combination of peaches and raspberries. Peach Melba, yummmmm. The Galette dough was very easy to put together and I accidentally made a full batch of dough. So I guess I will be making the Tomato and Cheese Galette tomorrow, especially with the fresh tomatoes and basil growing in the garden. I did have a little leakage while baking the galette so I was unable to plate it because the bottom was compromised. But the taste was simple and perfect. 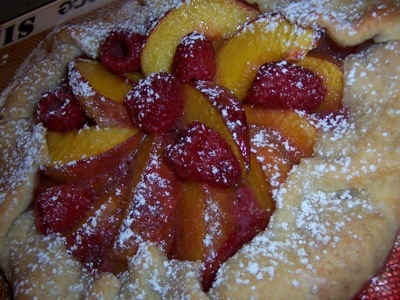 The sweetness of the peaches and the tartness from the raspberries was a perfect match. The cornmeal in the galette dough gave the crust a nice texture and flavor. I saw this recipe about a month ago when I was reading Ivonne’s blog, Cream Puff In Venice. As soon as I saw the picture I knew that I was going to have to make this tart. First thing I thought was if good quality peaches were available. The next was that I needed a square tart pan. After a month went by I procured a peck of fresh from the orchard peaches and stop by Williams Sonoma and picked up a square tart pan. While flipping through my Dorie Greenspan cookbook, Baking: From My Home to Yours, I found a scone recipe that caught my eye because it had old fashion oats in it. Back when I was in college I used to go to a family owned coffee shop that made all of their baked goods. I use to always get a peach oat scone and peppermint tea. I could sit in that coffee shop for hours and just people watch. I have not been back to my old stomping grounds for over a year now, and I really miss those scones.